Ed Sheeran has hit the news, bemoaning the inflated prices that tickets for his forthcoming tour are being sold at on ticket reseller websites. Some tickets have sold for as much as £999, compared to the original face value of £77. As the chart below shows, even the standard resold tickets are selling for up 5 times the original price. 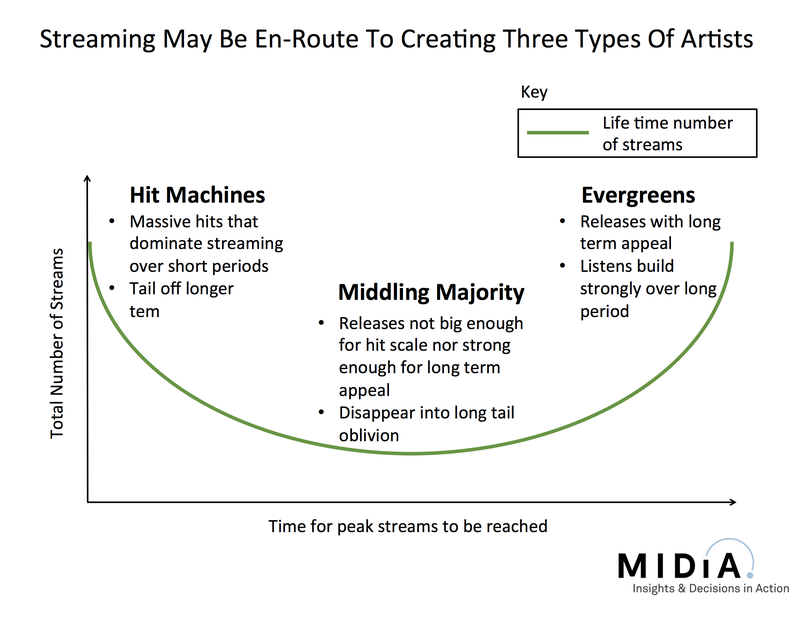 Ticketing companies are playing double agent: Over the course of the last decade the live music market has grown almost dollar-for-dollar at the same rate the recorded business has declined. 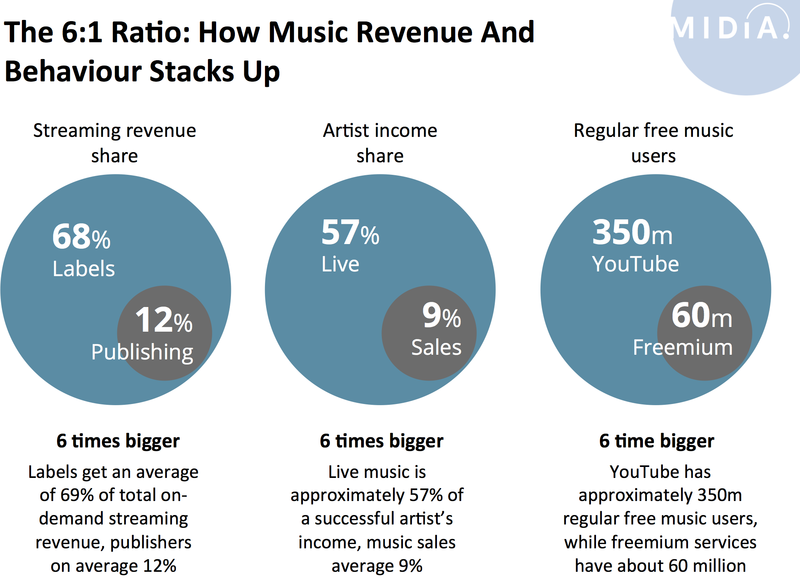 In 2000 live was around 30% of the global music business, now it is around 2 thirds. The live boom has long been seen as the good news for the music business, held up as evidence of value simply shifting from one part of the business to another, and the new way in which artists can build vibrant careers. The problem is that a) much of that growth has come in ticket price inflation, and b) most of the money does not make it back to artists. In fact, on average, artists only earn 14% of ticket sales revenue. Ticket resellers are a major contributory factor. Hiking up the prices and only distributing a small fraction back to artists, often in many cases (eg ticket marketplaces) nothing at all. The big ticketing companies are not merely passive observers, they are actively driving the reseller market, essentially acting as double agents and often cross promoting reseller destinations they own. For example, Ticketmaster is also the parent company of Seatwave and GetMeIn. Though Ticketmaster’s reseller destinations do not bulk buy tickets, some independent resellers have teams of people that do exactly that. Resold tickets put gigs out of reach of core fans: Resellers argue that there is a market for high priced tickets. There is, but it is a different market than that of core fans. Many sports leagues have seen a ‘gentrification’ of crowds, with older, more affluent fans being the only ones that can afford inflated ticket prices. The result is more subdued crowds and less vibrant atmospheres. The same thing is happening to live music, with young fans being forced out in favour of older audiences. It might be good for the ticket resellers and venues and booking agents, but it is bad news for bands and fans. The presence of ticket reselling marketplaces actively encourages nefarious behaviour, with a whole segment of professional resellers that use technology such as bots to bulk buy tickets before real fans get their hands on the tickets. There is an opportunity, nay a moral obligation, for more connected action to be taken to eradicate this sort of behaviour. It is a problem that can be fixed, but it requires coordinated effort: Ed Sheeran’s camp has told fans not to buy from resellers at inflated prices. But Sheeran’s camp have to shoulder some of the blame. The solution is as simple as it is complex. The simplicity is not to allow tickets to go to resell and to only admit fans whose names are on the tickets (which cuts out the ticketing marketplaces like Seatwave). But the complexity is that vested interests apply pressure to ensure this doesn’t happen. Nonetheless, action can be taken. Adele and her manager Jonathan Dickins took a bold stance last year, only allowing named ticket holders to attend some of her gigs. They even went as far as cancelling some resold tickets for other gigs. Mumford and Sons went one step further and booked Wembley directly, cutting out all the middle men. But isolated action is not enough. Unless artists, managers and labels act together, to take a bold stance, change will not happen. And the losers then will be the fans.